10 Important Nutrition for Child Growth - Even though your child is fed three times a day, it is not necessarily he will always be healthy. Who knows, the food he devoured does not have enough nutrients to help the little one grow and develop. You need to pay attention to the need for nutrition for children by providing healthy food of course. But before giving a healthy intake, it's a good idea to get acquainted with the following 10 essential nutrients for children. Calcium is one of the nutrients for children that is important for the body to get. Calcium serves to help the growth of strong bones and teeth, maintain healthy muscle and nerve function, helps the blood clotting process and helps the body convert food into energy. You can give calcium to children by giving them milk, fish, and cheese. Essential fatty acids turn out to have a myriad of benefits for children. These nutrients can help cell formation, regulate the nervous system, facilitate blood flow, strengthen the immune system, and help the body absorb nutrients. In addition, essential fatty acids are also needed to maintain brain function that regulates the child's senses of vision. You can provide nutrition for this child through foods such as eggs, tuna, and beans. Iron is an element that plays a role in the production of hemoglobin (the red pigment carrying oxygen in the blood) and myoglobin (a pigment that stores oxygen in muscles). Iron deficiency in children can cause children to get anemia. If your child experiences this condition, the child will tend to feel tired, weak and irritable. Provide essential nutrients for this child through iron-rich foods such as meat, egg yolks, and fish. Magnesium is an important mineral for the health and growth of children. Some of the benefits of magnesium for health are keeping the bones strong, making the heart rhythm stable, supporting the immune system, and helping maintain muscle and nerve function. You can get nutrition for this child through intakes such as fruits (avocados and bananas), tofu, fish and vegetables. Potassium is a nutrient that is responsible for maintaining blood pressure by controlling the balance of water in the body. Not only that, but potassium also helps muscle function and heart rhythm, and in the long term can reduce the risk of kidney stones and osteoporosis. 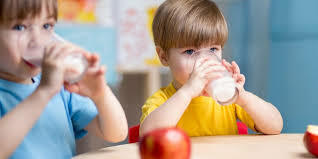 Give your child bananas, tomatoes and milk to get enough potassium in his body. In the body, vitamin C is used for the process of forming and repairing red blood cells, bones and tissues in their bodies. Vitamin C also keeps the child's gums healthy and helps the wound healing process, increases the immune system, prevents infection, and helps the body absorb iron from food. Parents must provide nutrition for this child and can be obtained through papaya, pineapple, and melon. Vitamin D intake is also important as other nutrients. This vitamin can help the child's body absorb minerals such as calcium, for the formation of strong teeth and bones, because the development of bone mass in children must be considered. You can provide vitamin D nutrition for children through food intakes such as eggs, tofu, tempeh, and fish meat. During childhood growth, vitamin E is needed to ward off free radicals that can damage cells. In addition, vitamin E also plays a role in the immune system, repairing DNA, and other metabolic processes. By eating foods like spinach. grains and avocados, you also provide a good intake of vitamin E for the child's body. Finally, zinc or zinc is a nutrient for children that is important to fulfill. More than 70 enzymes in the body need zinc (zinc) to carry out their respective functions in the digestive system, metabolism, and growth of children. You can find these nutrients in foods such as broccoli, spinach, and tomatoes.